My friend told me about this new garden gem. We are always looking for a way to kill weeds without using chemicals so I had to give it a try. When I first used the product I was surprised how easy it was to use. I went on a tear around my yard. When I used it I tried it with Avenger (a citrus oil based herbicide.) I tried it on a couple dandelions in the lawn then used it to spray my patios, then made my way to my veggie garden. I was impressed with the versatility around the yard! The best part was I felt good knowing I wasn't using chemicals. The moment of truth came the next day when I checked the results. It worked amazing! 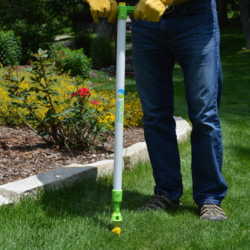 It does what it says, it barely harmed my lawn there were only tiny brown spots where I had used it. I definitely recommended this to anyone especially for those looking for an alternative to chemical herbicides.